This article is about the town. For the medieval Turkish leader, see Seljuk. For other uses, see Selçuk (disambiguation). 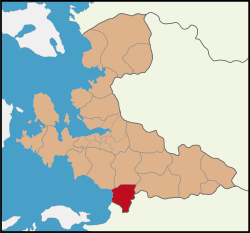 Location of Selçuk within İzmir Province. Its original Greek name, Agios Theologos (Άγιος Θεολόγος), referred to John the Theologian, because emperor Justinian had erected there a basilica in honor of the saint. Ayasoluk is a corrupted form of the original name. In the 14th century, it was the capital of the Emirate of Aydin, and visited by Ibn Battuta. He noted, "The congregational mosque in this city is one of the most magnificent mosques in the world and unequaled in beauty." Under the Ottoman Empire, it was known as Ayasoluk. In 1914, it was renamed Selçuk after the Seljuk Turks who first led incursions into the region in the 12th century. It was a township in Kuşadası district till 1957, when it became a district itself. Its neighbours are Torbalı from north, Tire from northeast, Germencik from east, Kuşadası from south, Aegean Sea from west and Menderes (formerly Cumaovası) from northwest. Selçuk is one of the most visited tourist destinations within Turkey, known for its closeness to the ancient city of Ephesus, House of the Virgin Mary and Seljuk works of art. The 6th century Basilica of St. John the Apostle, which, some claim, is built on the site of the Apostle's tomb, is also inside the town. Procopius said that the basilica was a most sacred and honoured place in Ephesus. It was severely damaged in the invasion of Selzuk Turks in 1090. The place was excavated in 1927, and Pope Paul VI paid it a visit and prayed there. The old quarter of Selçuk retains much traditional Turkish culture. Ayasoluk Hill dominates the surrounding area, with several historical buildings on its slopes, including the İsa Bey Mosque built by the Aydinids in 1375, and the Grand Fortress. Ephesus Beach (Turkish: Pamucak) is one of the longest beaches (12 km) in Turkey and hosts five large hotels. The youth football teams of the İzmir-based sports club Altınordu S.K. play their home matches in the Altınordu Selçuk-Efes Football Complex, which is located WSW of Selçuk. With five football fields, the venue is the largest in İzmir Province. Wikimedia Commons has media related to Selçuk. ^ Battutah, Ibn (2002). The Travels of Ibn Battutah. London: Picador. pp. 111, 310. ISBN 9780330418799. ^ Ertaç, Gürkan (4 May 2014). "'Önce Tesis' Dedi". Yeni Asır (in Turkish). Retrieved 2 October 2015.